Not every meal needs to be photographed. AT THIS TIME of year, all the smug people of the world like to congregate at the #CleanEats hashtag on Twitter and Instagram. There, they boast about eating healthy food and regularly post heavily filtered photos of their meals. It’s an unspoken rule that if you must partake in the #CleanEats shenanigans, at least make your food look appetising. 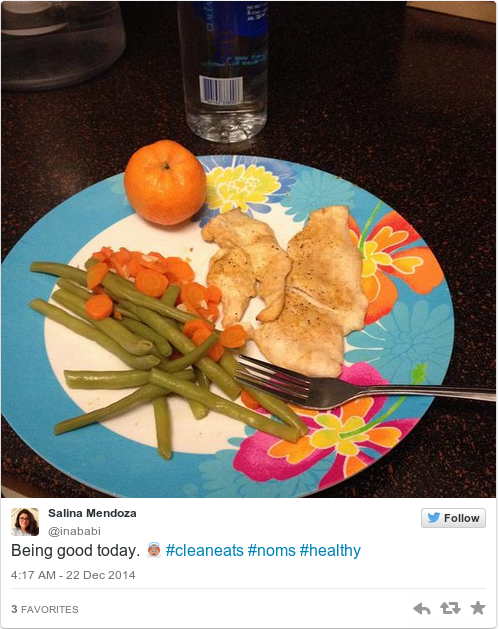 Unfortunately, a glance through the #CleanEats hashtag reveals that not everyone is abiding by this. So while we aren’t made feel guilty for our life choices (cough, eating Pringles, cough), we are forced to look at stuff like this. 1. At least make it look semi-appetising. 3. Oh lovely, a plate of vomit served with lettuce. 4. FYI: no matter how artfully you arrange it, a baby orange thrown beside a chicken fillet will never resemble a meal. 6. If you must take a photo, don’t make it look like the dregs of a kebab. 8. Not everything needs a close-up. 9. In fact, not everything needs to be photographed, full stop. 11. In fact, these are the only #CleanEats we want to see. Email “11 smug #CleanEats photos that should never have existed ”. Feedback on “11 smug #CleanEats photos that should never have existed ”.